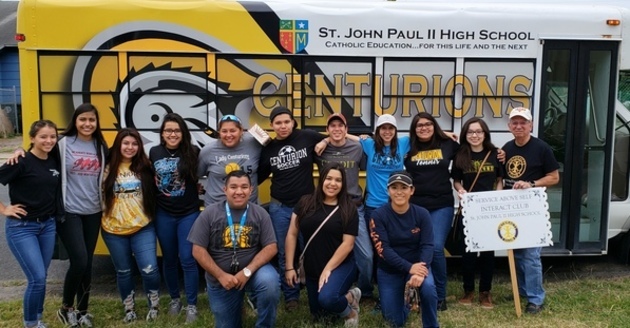 Students from St. John Paul II High School Rotary Interact Club partnered with Habitat for Humanity on April 20 by painting the interior of a house on Guadalupe Street which included the living room, dining area, closets and bedrooms. 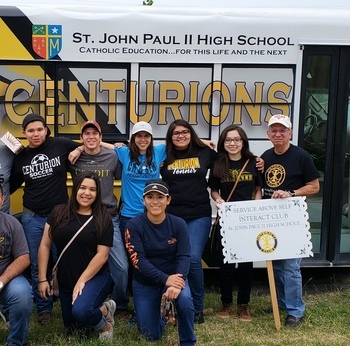 Thank you to Southside Rotary's David Walker and Ted Garcia from John Paul II High School for sharing this Habitat for Humanity story that appeared in South Texas Catholic. Students from St. John Paul II High School Rotary Interact Club partnered with Habitat for Humanity on April 20, 2018 by painting the interior of a house on Guadalupe Street which included the living room, dining area, closets and bedrooms. "The construction foreman for Habitat for Humanity was quite impressed with our students who stayed focused on why they were there and were receptive to instruction," Rotary Interact Club sponsor, Ted Garcia, said. Habitat for Humanity and volunteers help homeowners build or improve a home to make it affordable for families in need of a decent place to live. "The students' clothes were a bit more colorful when we left the house. What a pleasure it is to work with our students," Garcia said. Student volunteers were Emily Ayala, Gabriella Ayarzagoitia, Apolonio Esquiviel, Victoria Fuentes, Bridget Lee Sang, Grabrielle Lopez, Ryan Lopez, Savannah Martinez, Zenaida Perez, Bernadette Salazar, Josiah Salinas, Alexandria Serna and Maya Trevino.